So for the past year it’s been rather interesting. My studies for the Music Education Masters Degree picked up some pace and with the sessions and shows the website fell behind a bit. Haven’t done a lot of DrumCovers lately – been thinking of a new approach…keeping fingers crossed it will pan out. Other than that been keeping myself busy teaching drums both in childrens music-school and also at the University. It’s my first time I’ve done teaching aside of private lessons. Loving the experience and challenge of it. I actually wanted to throw out a thought I’ve been wondering about. I’ve been back in Estonia for about 2 years after spending over 3 years in Los Angeles studying and working as a session musician. Things are going well with the teaching jobs and gigging, but there aren’t too many international touring gigs for session guys like me and I kind of miss that. So what would be my options in perhaps returning to LA scene? Right now, I don’t have an answer to that, but it’s where my head is at and once I’m closer to any kind of development in that area, I will definitely post here too. I’d love to hear about people who are wondering about that too and put up a conversation on it. In the mean time, I’ll keep you all posted with upcoming stuff. 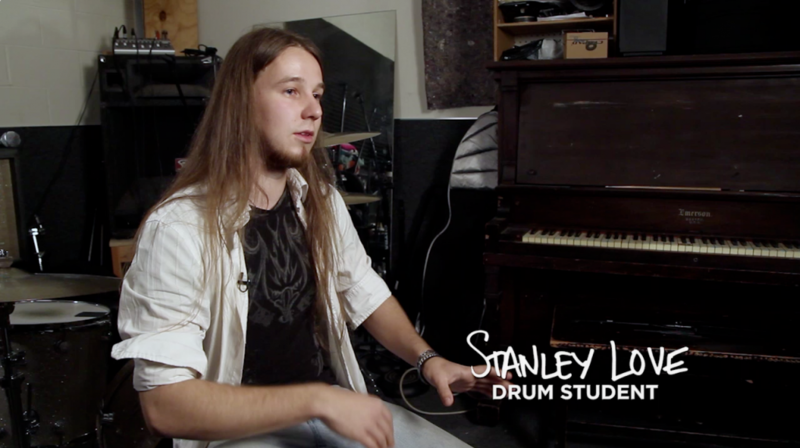 But if you want to see more daily stuff too then that would be on facebook.com/stanleylovedrums and instagram StanleyLoveDrums. Talk again soon. Be good! If you’re reading this, then you’ve probably seen at least one of my recent DrumCover videos as well. I put out my first DrumCover video late last year and have 7 of them out on my youtube channel right now with plenty of more to come! I’m currently working on my brand new solo project which I’m really hopeful for, but it’s a rather time consuming process so it might be a little while before I’m able to put out my first piece of music. Also, the recording gigs, that I’ve been doing aren’t for me to share before they’re released properly so I don’t know when I might be able to share any of that work. So for me the choice was to take up drum covers. There are so many ways to record drum covers and I’m lucky to be able to use a local studio to get a great sound of the drums and with the help of my close friends, get it all on camera as well! The main question I ask myself when I do these recordings (especially when it’s a popsong) is how should I approach to playing it. Many of them have programmed percussion track with effects etc. My options are to mimic the original as much as possible or to add some more live drumming aspects to it (possibly making the song feel a bit more rocking). The first option might be cool for recording purposes, but might be really dull to look at when you’re stuck with the “drummer-view” for the whole song. The second option is probably more exciting to look at, but might turn off some viewers/listeners who’ve been used to hearing the original track. Choices…Choices..
As for now, let’s have some fun with those songs and jam along! Hope your year has started off great! It’s been quite busy on this side.. Having to deal with some technical issues for recording and editing etc, but seems it’s coming together now. Continuing with my DrumCover series and this time it’s something a little different – James Bond’s latest movie “Spectre” soundtrack “Writings On The Wall” by Sam Smith. I guess it’s not really a DrumCover since there’s no drums on the original recording, but let’s not get caught up in semantics. I liked the song the first time I went to see the movie, but I felt though it didn’t really reach the climax and kind of stayed in one place the whole song. So now, once I started coming up with the drum parts for it, I tried to make it in a way to complement the song and make it feel like it could’ve been a part of it the whole time. That meant taking it slowly at first, let the music do the work and gradually adding more movement on drums and bringing up the energy of the song. Nothing fancy, just something to elevate it. One thing that made the recording part a bit tricky, was that the original track has A LOT of dynamics in terms of tempo. It moves up and down throughout the song and in some parts I had to listen really carefully to not miss the transitions and stuff. …And here’s the video! Enjoy! Let’s kick the new week off with a new cover. Carrie Underwood… one of my favorite Country/Country-Rock singers right now and this song really stands out with its drum-parts – it hits hard and it grooves hard.. perfect for a DrumCover. Big emphasis is playing groove on the toms.. It just gives the depth and dynamic to the whole song. Especially when it eventually breaks out and goes to the Ride-cymbal. It’s been a week and it’s time for another DrumCover. The main groove sounds simple, but when you start looking at it, there’s surprisingly many elements in it which isn’t that common in today’s popmusic anymore. The 2-bar phrase, varying with the kick and rim/stick click layered on top of it gives it more flow and depth I think. I wasn’t trying to figure out every single detail when I recorded this cover, but rather just go with the groove and just feel it out (or shake it off?). On the second chorus I went to the Ride cymbal to take the groove forward. I guess when you’re having to watch and listen to the drummer play the song, it’s good to bring some changes in. Coupled with some fills I think it works well. Due to some technical issues I’m not able to add the DrumChart at this time, but will do it as soon as I get my systems going. Thanks for checking out my blog and the video, there’s more to follow very soon! From here on I am planning on releasing a series of DrumCovers of all kinds of great songs in very different genres! Big thanks to Heli Otstavel, Rene Jõhve (cuuclub.ee) and Martti Leetsar (marttileetsar.com) for all the production work! Wow, it’s been a while… I’ve been dealing with some huge changes for the past 6 months or so and I’ve got some cool new projects, that are building momentum which I’m hopefully able to share with you all very soon! They released their new EP “Drifting Away” a few months ago, which this tune is a part of as well. Keep an eye out for some new stuff soon! Challenge of Frankenstein PART 2 – The Real Thing! Finally my band Radic got back the finished mix of our recording of our version of Edgar Winter’s awsome “Frankenstein”. Some time ago, I posted about the challenge I made for myself, but in case you were too lazy to read it I’ll make a quick recap. I decided to create a specific drum-part for the cover and then I charted it out in full detail. Since I usually have quite a lot of improvisation in my playing (fills etc), so the challenge was to play exactly by the chart every time, note for note. Soon after I headed to the studio and recorded the song. I’m quite happy with the result and I think I followed the challenge through quite well. You can check out the CHART here: Stanley Love Frankenstein cover drum-chart. Last year, some time in November, if I remember correctly, I was asked to do an interview for a short documentary about drummers, drumming and sorts. That documentary is “Timekeepers” on the “Whiplash” blu-ray special features section. The blu-ray was released 24th February this year. If you’re at all interested in drums, music or movies, you should know “Whiplash”. Great movie and it has definitely gotten the attention/praise it deserves. I’m extremely grateful to be a part of this documentary alongside with the all-time drumming greats like Simon Phillips, Peter Erskine, Chad Smith, Kenny Aronoff, Gregg Bissonette, Doane Perry, Roy McCurdy, Kate Schellenbach and Ryan Brown. I’m humbled and happy that I was asked to do this interview. Big thanks to the people who made this documentary – there can never be enough spotlight on drummers, haha! If you haven’t already, go and get that “Whiplash” blu-ray TODAY!!! TA – DAT – PSHHH!!! Some crazy stuff happening in my life and music right now and I will make other posts about some awesome news separately soon! This post, however, is about the latest recording and a side-challenge that I put up for myself. My band Radic recorded a cover of Edgar Winter’s classic instrumental “FRANKENSTEIN”. When we had the form set, I decided to write a complete chart for the drum-parts. I sat down with the ideas from the rehearsals and came up with a detailed part note by note and wrote it down. Figuring out how to write some patterns and fills wasn’t all easy, but it was super fun to do. I made a short video discussing and describing the process of it all and added the recording video from the studio as well. Please check it out and feel free to contact me with any questions/comments.